Modern Life Villas is a new luxury development consisting of 14 detached and semi-detached villas in contemporary modern design. 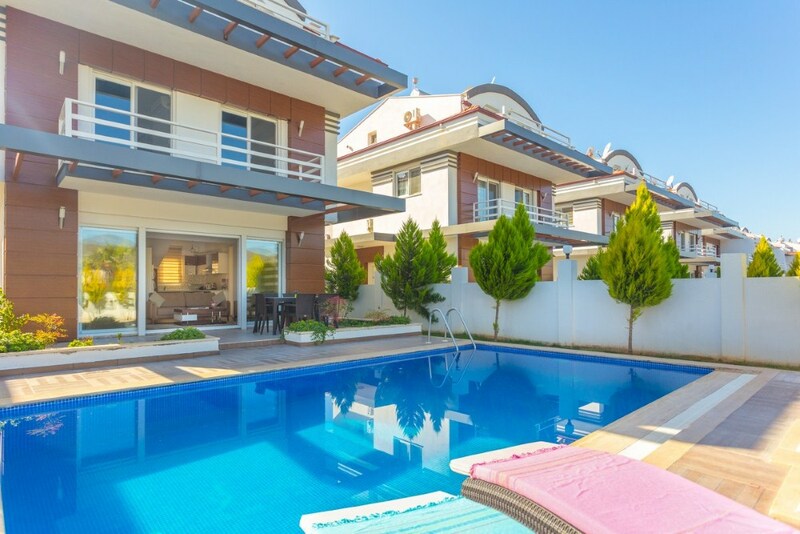 The villas are situated in the peaceful beach location of Koca Calis, just 400 m to the famous Koca Calis beach with its many beach restaurants and bars and is renowned for its magnificent sunsets. Luxury 4 bedroom self-catering detached villa finished to an extremely high standard, private pool and garden with off road parking. Fully equipped modern open plan kitchen, consisting of dishwasher,fridge freezer, oven, hob, washing machine, kettle, grill/toasted sandwhich maker, iron and ironing board. Open plan lounge with full size French doors opening to pool terrace and Alfresco dining area. There is a local shop near to the villa which can provide basic essentials. Larger supermarkets are in Calis and Fethiye. The ground floor exterior comprises a sun terrace with sunbeds and its own private pool, pool shower and BBQ. (Children and non-swimmers will need supervision).